Few festivals demonstrate such a pure dedication to music as much as those put on by HARD. Year after year, HARD puts together stunning lineups spanning all genres of electronic music for their flagship events, including HARD Summer, HARD Day of the Dead, and Holy Ship! to name a few. Case in point: today’s announcement of the absolutely stacked HARD Day of the Dead lineup, just another in the long line of excellently billed HARD events. This year’s spooky party will be taking place on November 1 & 2 at the Fairplex in Pomona, CA, home of the L.A. County Fair. Bringing in the haunted vibes will be a spectacular cast of artists, including some exciting headliners and a shockingly good supporting bill. 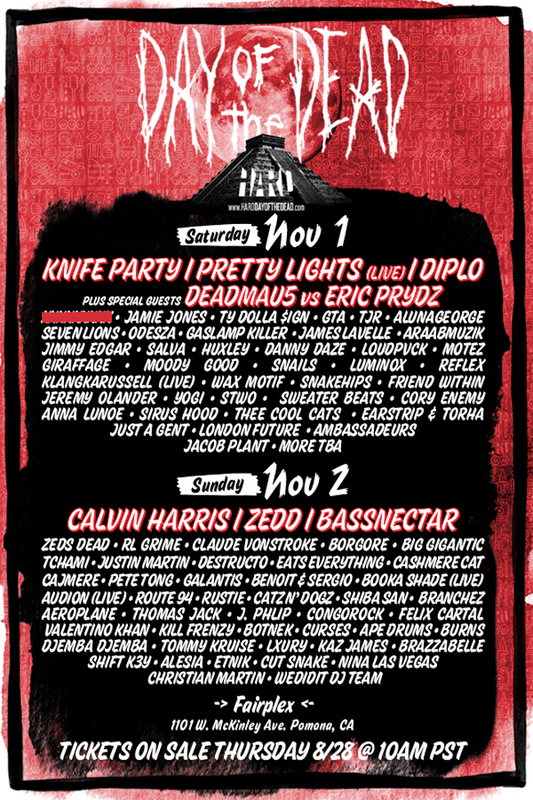 Headliners include Knife Party, a live set by Pretty Lights, Diplo, Calvin Harris, Zedd, Bassnectar, and an exciting VS. set between big-room progressive superstars deadmau5 and Eric Prydz. But that’s just the tip of the iceberg. Day of the Dead’s insane lineup includes a sweet lower bill that features everything from future bass to deep house to live German techno. Some notable acts include the likes of Seven Lions, ODESZA, The Gaslamp Killer, AraabMuzik, Giraffage, Klangkarussell (live), Zeds Dead, RL Grime, Justin Martin, Christian Martin, Claude VonStroke, J. Phlip, Eats Everything, Cajmere, Pete Tong, Galantis, Benoit & Sergio, Booka Shade (live), Aeroplane, Thomas Jack, Felix Cartal, Valentino Khan, and so, so, so much more. Seriously, so much more. We’ve never quite seen a lineup like this. It’s insane. Maybe take it easy on Halloween this year, because the following two days, it’s time to go HARD. Grab your tickets HERE starting this Thursday, 8/28 at 10 a.m. PST. San Francisco Bay Area. Music Lover (Deep, Bass, Tech, House; all things electronic). Festival-Goer. Traveler. Movie Watcher. Sports Fan. Food Eater. Beer Drinker. Comedy Enthusiast.